The shoulder is a ball-and-socket type joint consisting of three bones, four muscles, and four tendons – all connected with ligaments. The shoulder has the greatest range of motion of any joint in the human body, making it more susceptible to injury, wear and tear, and pain than other joints. The tendons found in the shoulder’s rotator cuff can become inflamed from repetitive motions like throwing, shooting a basketball, and lifting weights overhead. These tendons are enclosed within a thin sac called the bursa that is filled with lubricating fluid. The bursa can swell when it is aggravated, resulting in a condition known as bursitis. Other common causes of shoulder pain are shoulder instability, shoulder impingement, shoulder dislocation, rheumatoid arthritis, and shoulder separation. Shoulder instability is usually caused by trauma, when the connective tissues like the ligaments become stretched too far. This condition is common in high-impact sports like hockey, rugby, football, and downhill skiing. Any repetitive type of motion can play a factor in the weakening of the shoulder. Keeping a certain level of strength in the shoulder’s muscles can help stave off the effects of shoulder instability. Also, ensuring proper form while playing sports is critical, as the incorrect motions can place added strain on those connective tissues and further weaken the joint. Most people can recover fully with targeted physical therapy. Exercises that require raising the arms overhead can cause shoulder impingement. Impingement is the rubbing of the shoulder muscles against the top of the shoulder blade, which causes pressure on the rotator cuff. This type of injury is typically due to excessive overhead motions like pitching in baseball and shooting baskets. If the rotator cuff is inflamed or injured, the motion causes pain. The common treatment for impingement is physical therapy and over-the-counter NSAID medicines. A dislocated shoulder happens when the ball at the top of the humerus bone or another bone slips out of place, making movement extremely painful and difficult. The connective tissues can be stretched, and simply trying to raise the arm causes intense pain. Putting the shoulder back into place should be reserved for a medical professional only, in case there are any fractured bones. 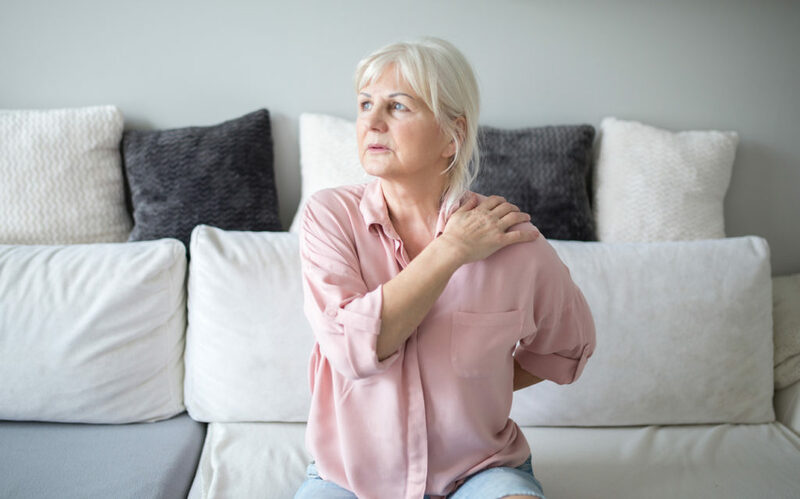 This form of arthritis happens when the immune system attacks the body’s joints, resulting in pain and inflammation of the shoulder joint lining. The disease can cause erosion of the shoulder bones, and over time a deformity is possible resulting in even smaller range of motion. Treatment for rheumatoid arthritis is done with disease-modifying drugs like methotrexate, corticosteroid injections, and if the disease is advanced, possible surgical intervention. A separated shoulder is actually an injury involving the acromioclavicular (AC) joint where the collarbone joins the highest point of the shoulder blade. The separation is most frequently caused by a direct fall onto the shoulder either from a height or at a high rate of speed, like downhill skiing into a tree. Deformity is present on top of the shoulder, which appears as a lump. Wearing a sling, using cold packs, and taking medication can help with a shoulder separation injury. If you live in the Dover area in New Jersey, visit the professionals at Orthopedic Associates of West Jersey. Our board-certified and fellowship-trained orthopedic surgeons have decades of experience treating orthopedic injuries and illnesses. Call us at (973) 989-0888, or set up an appointment online.